You won’t find a selection like this anywhere else! Rich navy and white pillow top boxes are packed full of delicious chocolate and crunchy nuts. 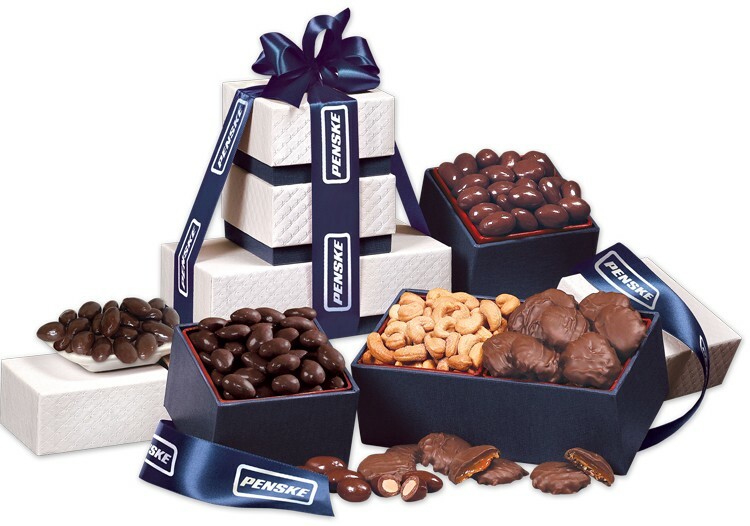 Your lucky recipients will open the boxes to find lightly salted Extra Fancy Jumbo Cashews, chewy Pecan Turtles, decadent Dark Chocolate Almonds, and our famous Milk Chocolate Almonds. All of this goodness is tied together with a navy satin ribbon foil-stamped in white. They’ll be sure to appreciate your thoughtfulness in choosing this delicious gift. • Price includes imprint foil-stamped in white on navy ribbon. • Imprint Area: 3" x 0.75"
Dark Chocolate Covered Almonds, 6 oz.